Bass fishing in Morocco When the wind is in the East, the fish bite the least! The Good news is, that the Plaice are around in decent numbers now. I was guiding yesterday on one of the nicest days of the year, on a stunning and almost empty Chesil Beach at West Bexington. It did look like most of the anglers we could see were catching Plaice. This was probably down to the fact that we had a mid sized tide and the lack of other anglers. Now for the Bad news. I have noticed that the algae is starting to build up and group together. I hate to say it, but that is the start of the May Water. If this sunny and warm weather continues, it looks like we will have it early this year. However the earlier we get it, the sooner it should go away, or at least thats what I am hoping. To add to that news, I can confirm that the Spider Crabs have moved in, and are happily sniping off the baited hooks. The best way I have found to combat this is to either use floating beads to keep the bait up off the seabed, or use braid on your hook lengths. Even spider crabs have problems cutting braid. 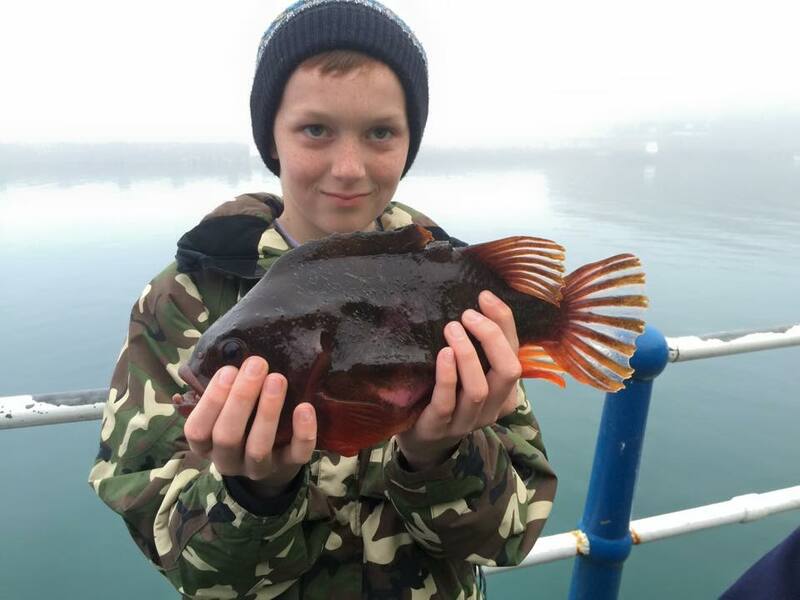 I always like to feature anglers that catch good fish, but this Lumpsucker weighing 3lb 14oz caught by Archie Gough on the Pleasure pier is one of the best fish I have seen for ages. It sure is ugly, but I would love to catch one. Looks like I will have to start the fish of the month competition up again. Archie caught it during the Weymouth Angling Society. weekly junior match, that is fished every Monday evening. I can’t believe that after losing my rod and reel last week, I snapped one of my other rods whilst casting yesterday. It is time to buy a couple of new rods and a reel now. I am fairly certain that I am going to buy at least one long continental style rod. The only problem is there are now so many to choose from. Please feel free to comment on any recommendations, but only if you have actually used the rod yourself. Talking of testing rods, I have a couple of new ones arrived this week, that I have been looking forward to using for some time now. One is the Yamaga Blanks Early, lure rod. It is a 9ft 2″ rated at 10-32g. I am looking at this rod to use when I am fishing in rougher weather. Hopefully it will allow me to punch out a larger Savage Gear Sandeel or similar lure into the wind. The first indications are it will be a great rod. 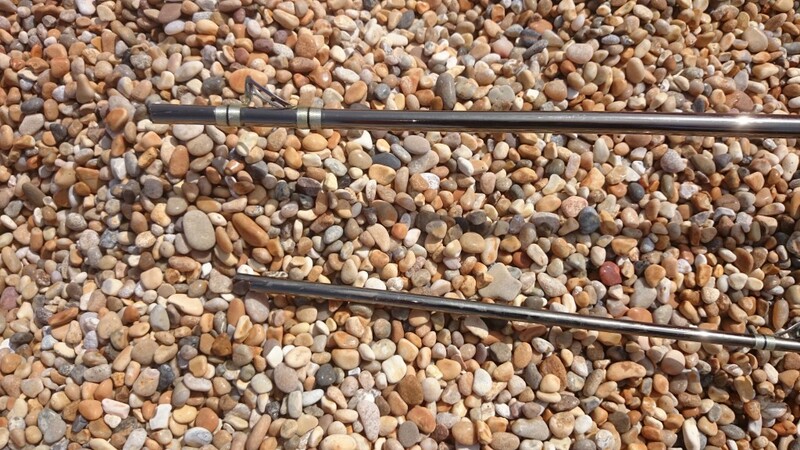 The other set up I have been testing this week is a boat rod and reel combination from Temple Reef. 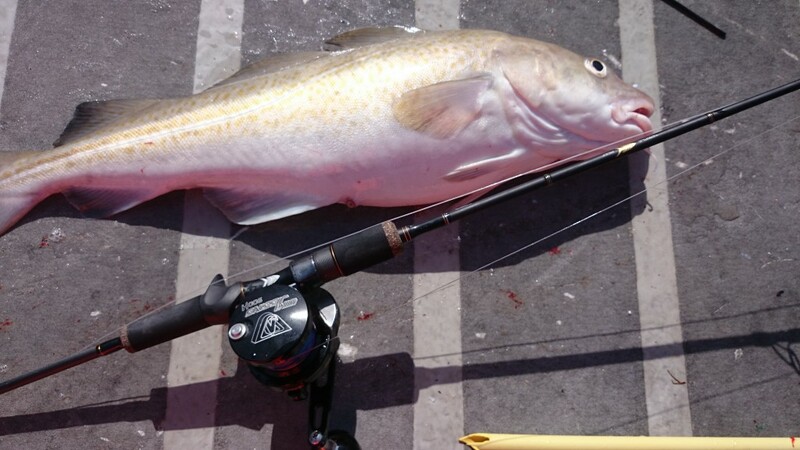 I believe that by using high speed jigging techniques, normally employed in fishing abroad, in this country I can increase my catch rate on fish like Bass, Pollock and Cod. I tried with the Temple Reef Mythos rod and the Wiki Jigging reel, when I was wrecking on Wednesday; I loved it. The set up is ridiculously light and thin, but it allows you to fish with much more finesse. I managed Pollock and Cod on it. The rods and reels are far from being comprehensively tested, so don’t expect a review of them just yet. This Sunday is the 43rd Chesil Championships, run by West Bay Sea Angling Club. Sign on is from 9.30am at Freshwater Beach Holiday Park. First prize is £250. 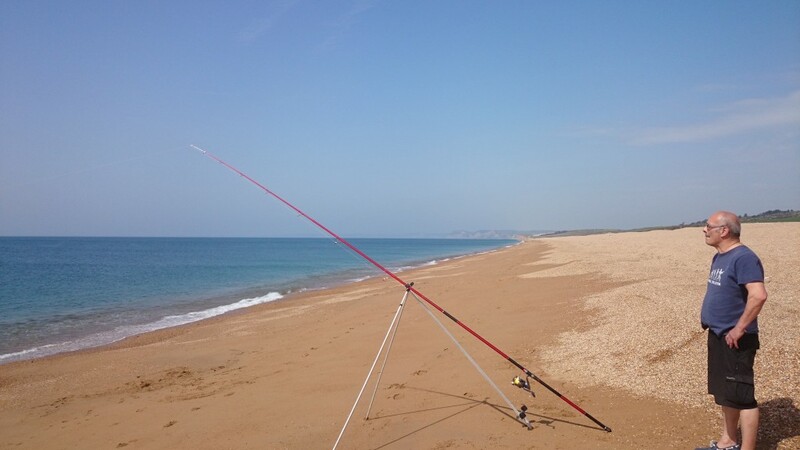 Fishing is from Burton Bradstock (Hive Beach) to Dragons Teeth at Abbotsbury. For more information you can call Steve Fowles on 01297 443544 (evenings only). As I have been so busy fishing and filming this week, I have not been able to get the other articles out that I had hoped to do. I will have the Peeler Crab video ready by Monday. Chesil Beach forecast: It looks like it is going to be fairly windy on Saturday, but don’t let that put you off fishing Chesil. The wind is from the East, so your casts should go much further than normal, which will help get you out to the clay beds and into some Plaice. The average size of the Plaice at the moment seems to be around 1 1/2lb, but several 4lb Plaice have already been caught. Black Lug seems to be doing better than Ragworm for the Plaice, but if you are after a big one, then think about using Peeler, or Razor Clams. Mackerel are now showing more regularly, so its well worth the effort to try and catch them. I would expect to see Herring with the Mackerel shoals this month. If you want to target Herring then go light, with small Sabiki lures and a 1-2oz weight. With the Spider Crabs now moving in, the Smoothound are usually close behind. Peeler and Hermit Crab are by far the best baits for them. Portland Harbour: The little Terns have taken up residence along the Fleet. This is always a good indicator that the Bass will be along within weeks. They feed on small bait fish, which are hunted by larger bait fish, which in turn get hunted by the Mackerel and Bass. Portland Harbour is one of the first marks that normally produce Bass. Due to the Easterly wind over the weekend, it wont be a comfortable mark to fish. Weymouth Bay: As you can see from the picture of the Lump Sucker above, Weymouth Piers can and do produce fish all year round. You never know what you will get when you fish the Piers. They regularly produce Wrasse, Pout, Pollock and in the next few weeks Mackerel and Garfish. The Mullet are starting to fill the harbour now. Looks like it is time to get the Mepps out and try and catch my first Thin Lipped Mullet of the year. Fishing Tails > All Articles > Reports > Chesil Beach > Good news and Bad news! 10 Responses to "Good news and Bad news!" 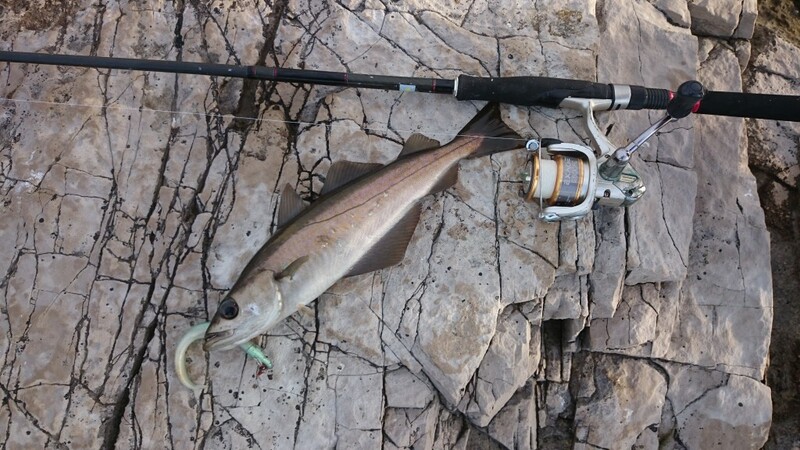 I’ve been using the fifteen ft trabbucco cassopea rod and trabbucco xride reel,lovely combination. I get out quite abit further than my century carbon metal and 6500 abu sports mag, which I sold recently,would recommend trabucco. How does it handle larger baits like a full Squid Ian? Keep up the good work, these weekend reports are realy good news, especially for anglers who have to travel to the coast. I live in Shaftesbury and the coast weather is never as advertised. But your reports guide me as to which location is worth travelling to. Thanks. Hi Shaun, have you tried out a Vercelli Spyra Amarella? 14ft very light and casts incredibly well with 3 to 5 0z lead. Exellent bite detection too. The red one is the Fiamma, a stiffer rod than the Amarella as it is full carbon (no hybrid tip). Casts well and feels as if it can stand up for itself on rougher ground or bigger weights/baits.. I have both the Fiamma & the Amarella and would happily recommend either to anyone. You might want to look at the black one they have coming out in the Spyra range (I think it’s the Nero), I looked at one at the Big One , a nice rod! Look at the Tronix site, George has them all on there, also Tronix are now the supplier for the Yuki rods too…. I have recently bought a Yuki Hummer from KN Fishing in Cyprus, it’s pretty awesome. The tip is extremely sensitive. Hi Sean, I have a Penn 15ft 9inch – it casts Ok and has a good backbone for larger fish, which some of the longer rods don’t have. Price not too bad, but probably a year-round alrounder. As for the spiders, my brother has come up with a useful tip to minimise losses. He ties on the beads etc for plaice, but then puts a second stop-knot below the beads, so the chances are you lose only the hook rather than all the beads. Also use a loop connection with spares for quick turnaround if you are losing hooks to spiders. Also, if your are getting big spiders in – often they get hooked properly or tangled in the gear, dont lose sight of the fact that they are delicious!